Sydney buses are running late more often, and falling further behind a goal set for 95 per cent of them to run on time across the network. Performance targets in the NSW budget reveal only 90 per cent of timetabled bus services started their trip on time this year, continuing a slide over the past two years. Traffic in the central business district is the biggest cause of the worsening bus performance, and the drivers' union has complained that schedules are so frequently behind that hundreds of drivers finishing routes in the city are having to forgo toilet breaks to try to catch up. Impossible timetables, mechanical defects and falling safety standards are just a few of the complaints being levelled at the private companies that rule the bus routes across greater Sydney. The New South Wales Government contracts private companies to operate bus routes in 15 regions that cover the greater Sydney metropolitan area. The State Government used to negotiate contracts directly with the incumbent operator in each region. But in early 2012 it switched to a competitive tendering process and the Transport Workers Union (TWU) says that process had led to cost cutting and reduced safety standards. TWU assistant state secretary Michael Aird says competitive tendering has simply resulted in a race to the bottom. "The focus has been on cutting costs," he said. "We've seen companies that have provided services in these areas for long periods of time lose out to new companies that have come in and heavily undercut them." The TWU has surveyed 285 drivers working for private companies. It found 55 per cent of drivers said they had reported serious maintenance issues which were unresolved the next time they drove their buses. Ninety per cent of drivers reported feeling pressured to drive unsafely in order to meet on-time running schedules. Almost 80 per cent of drivers said they had been abused by customers because of unrealistic timetables, while 67 per cent of drivers said they did not have access to clean and hygienic staff facilities. Dave Pola has been a driver for a private bus company for 25 years and says he hears horror stories from other drivers. "They're very concerned about the state of some of the buses that they're driving," he said. "They [report] the defects and they'll come back here [and tell me] they didn't fix it." The bus companies are required to meet a 95 per cent on-time running target and are penalised if they fall short. Mr Pola says many timetables are simply unrealistic and says he has heard of drivers being hauled in front of management or questioned over their bus radios to explain why they are running late. "The pressure comes straight back to the driver," he said. "You have to meet those on-time running commitments and the driver feels his job is under threat if he can't do it." The TWU says it has heard reports of a bus being run unregistered for a month and numerous buses found with defects. Mr Aird says it is putting drivers and the public at risk. "There is potential here for a catastrophe," he said. "There is potential for deaths and injuries on our roads." The TWU is urging the State Government to review the competitive tender process in order to protect drivers and passengers. But Transport for New South Wales (TfNSW) has defended the tender process, saying the new contracts provide higher standards of service for customers and greater value for taxpayers. In a statement, a spokesperson said TfNSW sets the frequency of service for all routes and approves operators' timetables. The spokesperson also said all buses are required to pass the Roads and Maritime Services Heavy Vehicle Inspection Scheme and are inspected twice a year for safety. The new bus services are set to benefit bus customers on busy routes across Sydney’s Inner West, Eastern Suburbs, North Shore and Northern Beaches. Additionally, the 225 bus route between Cremorne Wharf and Neutral Bay Wharf is running for extended hours on Sundays for customers connecting with ferry services. The 362 bus will resume its weekend service between Bondi and Coogee beaches this week, providing transport for customers visiting Sculpture by the Sea as well as thousands of beachgoers over the summer. The new weekly transport services will take the total number of services introduced across NSW to 10,500, since March 2011. This figure includes an extra 9,200 weekly bus services, 1,190 train weekly services and 220 weekly ferry services. To find out more about extra services and timetable information, customers can visit the NSW transport Information website (link is external), or check the real time apps, available from the App Store and Google Play. The NSW Government released Sydney’s Bus Future in 2013. This is the long term plan to redesign the bus network to meet customer needs now and into the future. Sydney’s Bus Future identifies the city’s most important bus routes, as the focus for investment in bus priority and more frequent services. The Bus Priority Program supports Sydney’s Bus Future by delivering projects that make bus services faster and more reliable. Measures include red bus lanes, bus priority at traffic lights, changed parking restrictions and clearways, and relocating bus stops. Find more information at Bus Priority Program External websiteincluding key projects under development by Roads and Maritime Services. ^ Shows again what a backwater Brisbane is in reality hey? Actually it's very radial, just that the busiest corridors focus as much on Parramatta as the CBD and so there is a bit of a basket-weave happening. Plenty of cross connections .. that is high frequency ..
To be honest, the high-frequency network is naturally going to be mostly a radial one, because that is where the bulk of passengers wish to go. I mean, even our own proposal for Brisbane is very radial - there are only a few frequent crosstown routes. But the network isn't broken. Mayor says so. The problem up here is that they seem to dragoon anybody at DTMR who doesn't look too busy into wearing a green shirt and heading out with an Ipad, but with little to no understanding of what it is they are meant to be informing people about (hence the tablet). The NSW Government is taking action to deliver transport improvements for the Northern Beaches, including a program of works to deliver kerbside Bus Rapid Transit (BRT) from Mona Vale to the Sydney CBD. The Northern Beaches BRT service will be called B-Line and is scheduled to start operating in late 2017. The B-Line will provide more frequent and reliable services for customers travelling between the Northern Beaches and the Sydney CBD. Sydney needs major bus reform as well. Similar issues as Brisbane. 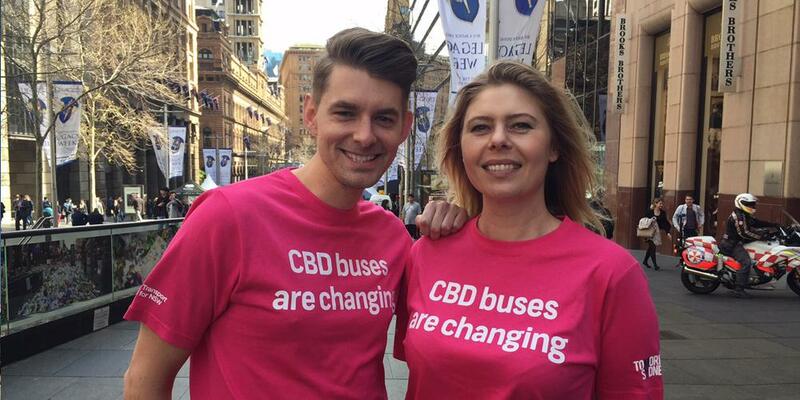 A number of bus routes from Sydney's north will no longer extend to the CBD, forcing commuters to switch to other services earlier in their journeys to get to the city. Wow, that looks like a movie scene! Why don't they just tax pollution instead? No need to put chemicals in the fuel that causes risk of explosions like this. The whole thing is a fireball! Almost 2700 buses in Sydney and across NSW have yet to be fitted with fire suppression systems that could have avoided a blaze that erupted on a bus carrying 30 passengers over the Sydney Harbour Bridge on Thursday. While good progress had been made on retro-fitting government-run buses with fire safety systems, Transport Minister Andrew Constance conceded on Friday that a multi-million-dollar contract to do the same with 2400 privately-run buses has yet to be awarded. The revelations about buses that operate on school routes and regular services in greater Sydney come more than a year after Mr Constance announced the program to make vehicles safer. 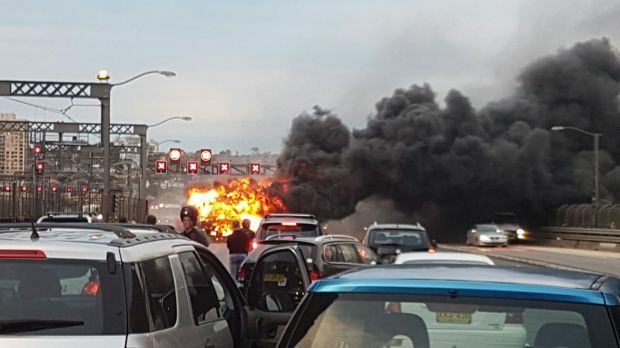 Two passengers and the driver of a State Transit bus were taken to hospital on Thursday night suffering from smoke inhalation, following dramatic scenes that brought traffic to a standstill on both sides of the harbour bridge in the evening peak. It was the 36th bus fire in NSW so far this year, raising the prospect that a spike in incidents recorded in 2015 will be surpassed. Mr Constance said a request for proposals for fire suppression systems for privately run buses had been issued in April and he defended the time it was taking to retrofit the private buses. "We have to maintain a transport network," he said. "We have to work with private sector operators. There's 27 different bus types which are going to be required to be retrofitted in conjunction with the private sector." Mr Constance said the tender would be issued next month and the expectation was that all buses would be retrofitted by the end of 2017. "I'll be doing everything I can to expedite it," he said. The two-decade-old bus that burst into flames on Thursday did not yet have a fire suppression system. The system works by detecting a fire or heat within a bus engine bay and activating a high pressure mist. About 265 of the State Transit Authority's 2700-strong fleet still need to have fire suppression systems installed by the government's deadline of the end of the year. The Rail, Tram and Bus Union Bus said the government's timetable for fitting fire suppression systems "isn't good enough". "It is too dangerous to have buses on the road that don't have these simple fire suppression mechanisms installed. Passengers and drivers can't wait any longer," the secretary of the union's bus division, Chris Preston, said. "This [fire on Thursday] could and should have been avoided." The suppression systems give more time for passengers and drivers to escape vehicles, while also increasing the chances of confining damage to buses. Mr Preston said it was too early to draw conclusions about the cause of the latest fire but many of incidents in the past had started in the engine bays at the rear of buses. "The buses run constantly and it gets hot. We are also now approaching summer, which makes a difference," he said. Last year NSW had a significant spike in bus fires. According to the Office of Transport Safety Investigations, 40 bus fires were recorded in 2015, compared with 29 in 2014 and 28 a year earlier. Of those fires last year, 40 per cent started in the engine bays of buses. Fires starting in the brakes of buses also increased markedly, rising from six in 2013 to 17 last year. The state safety investigators are expected to provide a report to government about the latest bus fire within a couple of days. Mr Preston said the union had been calling for the problem to be fixed for years, and the "public deserves answers as to why the government is still sitting on their hands as buses burn". "It is beyond belief that we are still seeing our public buses catching on fire on our roads putting passengers, drivers, pedestrians and other road users at enormous risk," he said. Mr Constance said there was "no systemically, single identified reason for the ignition of a fire in a bus". He described the fire that engulfed the bus on Thursday as "horrendous" and thanked those involved in the emergency response, including the 35-year-old bus driver whose actions he said were "above and beyond the norm". State Transit chief executive Peter Rowley said the bus at the centre of the latest incident had been maintained to the required standards and had its most recent major service on July 22. It was due for a visual inspection of water, fuel and oils this week. "There is no fault identified with this vehicle prior to the fire," he said. Mr Rowley said fires were "extremely difficult to predict or diagnose". "Our buses are safe," he said. "There are no systemic issues with regards to our buses that would warrant the removal of the buses [from the road]." While Keolis Downer and Transit Systems are eager to bid, any decision to allow them and other private operators to compete for contracts now held by the government-owned STA is likely to meet stiff opposition from unions. They fear it will lead to cuts to drivers' wages and conditions, as well as bus routes deemed unprofitable. A Sydney bus which caught fire on Friday morning did not have a fire safety system installed and has raised pressure on the NSW government to race to have the suppression systems fitted in all public and private buses. Two buses have been completely destroyed by fire in the Blue Emu long-term car park at Sydney Airport. The fire was extinguished about 3pm by two Fire and Rescue NSW crews, with assistance from airport fire services using bulk foam pumps. The buses were empty when the fire started, with no persons or other parked cars nearby, Fire and Rescue NSW said. Shortly before the fire, the driver of one of the buses had left the car park to report a mechanical fault and overheating of the bus, a spokesperson for Fire and Rescue NSW said. About 200 jobs will be axed at State Transit – most of them from support roles – as the government-run operator slashes costs to allow it to hold onto large Sydney bus contracts. In a blow to staff just two weeks before Christmas, State Transit has told its heavily unionised workforce there will be cuts to back-office support roles and a major overhaul of managerial and salaried jobs. Some 40 per cent of the 500-strong workforce that falls under the umbrella of "State Transit Executive" will be axed by late next year. The threat of the Baird government putting State Transit's lucrative Sydney bus contracts into the hands of private operators has been hanging over staff for months. As a consequence, the pressure has been on State Transit to slash costs in order to convince the government to extend its four Sydney bus contracts for a further five years. Following its latest cost-cutting efforts, State Transit has reached an in-principle agreement with Transport for NSW for four new five-year contracts for bus services in Sydney to begin from next July - a year earlier than hoped. Rail Tram and Bus Union divisional secretary Chris Preston said he was concerned that the loss of about 200 support staff would impact frontline workers and bus services. However, Mr Preston said the renewal of four of State Transit's bus contracts would safeguard the jobs of 3300 bus drivers at 12 depots in Sydney. "In light of recent privatisation of bus contracts in Newcastle, and Transport for Newcastle's transition to a private operator, we're relieved to see the privatisation tide hasn't turned for all NSW public buses," he said. While private companies such as Hillsbus and Transdev operate bus services in Sydney, State Transit-run Sydney Buses still carries the majority of the city's passengers. The government-owned authority's contracts cover the CBD, the northern beaches, Paramatta, the eastern suburbs and south to suburbs such as Mascot. A State Transit spokeswoman said expressions of interest for voluntary redundancies would occur in the new year for executive and corporate staff. "As part of an effort to become more efficient and continue to provide services to Sydney, State Transit has offered to reform parts of our corporate back office," she said. "This will ensure State Transit's metropolitan bus contracts can be renegotiated and ensure taxpayers are getting the best value for money." State Transit declined to reveal the cost savings it was targeting. Cleaner than a bus and cheaper than light rail, track-free trams could be shuttling passengers along Parramatta Road within the next five years. Track-free trams? Yes, that's what they're calling them. And the Inner West Council is pushing the idea as a solution to the transport woes of the Parramatta Road. In fact, four councils in Sydney's inner west are supporting the notion, which they see as a potential "game changing" public transport option to be introduced concurrently with the WestConnex motorway. "There have been more than a dozen plans to transform Parramatta Road over the years – and they have all failed due the lack of commitment to a real public transport solution," said the administrator of the Inner West Council, Richard Pearson. Under the $200 million plan, released on Tuesday by Mr Pearson's council, the electric trams – operating on battery power rather than power lines – would run down the middle of Parramatta Road, carrying people between Strathfield and the city. The trigger for the Inner West study was the WestConnex motorway, which the state government said would remove traffic from Parramatta Road and civilise it for more residential and community uses. But the state government has failed to settle on its own transport plan for Parramatta Road. And with the clock ticking towards the completion of the $16.8 billion motorway in 2023, the Inner West Council is keen for a public transport option that could be open before the motorway's completion. "Parramatta Road should change from being a thoroughfare to a high street – with shopping, dining, and a good living environment," Mr Pearson said. One advantage of the track-free tram idea is that it could be implemented relatively quickly. It would also be cheaper than light rail, and have the key engineering advantage of being able to run on a relatively narrow strip on the middle of the existing road. This would allow kerb-side lanes to be freed for parking or other uses. Ken Welsh, the council's strategic transport planner, said the trams could use a narrower lane than buses because they were equipped with optical guidance technology, similar to that used in luxury cars, which enabled them to stay within the lane. "There is still a driver, but they mostly control speed, and they don't have to worry about horizontal wobbling." Mr Welsh said trams had the added benefit of having a "much lower" carbon footprint than diesel buses. While this would be the first system of its kind in Australia, track-free trams are used in a number of European cities, including Barcelona, Geneva and Luxembourg. Former Mayor of Leichhardt Darcy Byrne, who initiated the study before the council was amalgamated in May last year, welcomed the findings, alongside mayors from Burwood, Canada Bay and Strathfield councils. "What we don't need is another good idea gathering dust – there is a narrow window to transform Parramatta Road or it will be a basket case forever," My Byrne said. The plan is still in a conceptual stage, but the Inner West Council has pledged $80,000 towards a feasibility study in a bid to entice the Berejiklian government to back the proposal and co-sponsor the study. Change doesn't come easily to the northern beaches and former Labor premier Barrie Unsworth is doing his bit to fight it, finding an unlikely ally in Liberal Bronwyn Bishop. Taking aim at the proposed B-Line bus service, Mr Unsworth has tapped into a vein of discontent in the Liberal heartland, which is broadly brewing around the new bus service, council amalgamations and the fears of overdevelopment in the northern beaches. The NSW government has committed to a tolled motorway tunnel linking Balgowlah in Sydney's north to the Warringah Freeway in an effort to relieve traffic congestion on the northern beaches. Vision courtesy Ten Eyewitness News. Calling the B-Line a "Trojan horse" for development, Mr Unsworth has slammed the expected privatisation of the new bus corridor between the northern beaches and the CBD, and the decision to build a new bus stop at Mona Vale's Village Park. "We've had government bus services for as long as anyone can remember. We're all happy with the operation of the buses now," Mr Unsworth told Fairfax Media. He said the Village Park bus stop would pose "safety issues" for residents disembarking late at night, and the "perfectly good" existing bus stop near on Pittwater Road near Waratah Street should be retained. The issue has opened an exchange of fire between Mr Unsworth and the local federal member for Mackellar, Jason Falinski, who wrote to NSW Premier Gladys Berejiklian in February in support of the B-Line being operated by a private company. Accusing Mr Falinski of "interfering in state matters", Mr Unsworth has thrown his support behind Mr Falinski's predecessor Bronwyn Bishop, who was rolled in a preselection battle for the seat before the 2016 federal election. "We live on the northern beaches – we understand the issues. Bronwyn is onside with the issues we're onside with," Mr Unsworth told the Herald. Mr Falinski fired back at the former premier and former transport minister, accusing him of being part of a group trying to stop "even modest improvements to public transport". He rejected Mr Unsworth's bid to link the B-Line with overdevelopment as "hysterical, both in claims and humour terms" and said they "lacked any evidence whatsoever". Mr Unsworth and Ms Bishop spoke at a forum of more than 100 residents in Mona Vale last week, which was held to protest the B-Line and the perceived overdevelopment of the Pittwater electorate. The pair are unlikely allies. Mr Unsworth built his career through the Labor union movement before moving into politics. He served as transport minister in the Wran government before becoming premier in 1986 and, more recently, was chairman of the state transit authority between 2005 and 2009. Ms Bishop, who resigned as federal speaker after it emerged she had used parliamentary expenses to charter a helicopter to a Liberal Party fundraiser, is a vocal advocate of free enterprise and has been critical of the union movement. "We're up against brutalism here in Mona Vale," Mr Unsworth told the rally on April 9. "The B-Line is going to cause a lot of destruction along its route." Ms Bishop, who was in the crowd, then took the stage and made an impromptu 10-minute speech. She avoided the B-Line issue, but said the northern beaches lifestyle was being "threatened" by more people "coming into the electorate". "High-density living is what most people who live here have come to escape," she told the gathering, before voicing her disapproval of the state government's forced council amalgamations. In a comment which drew applause from the crowd, Mr Unsworth called out "bring back Bronwyn" – a line that he had road-tested at a rally in Village Park several weeks earlier. "I'd like to run a campaign [to] bring back Bronwyn," he told the small crowd last month. But in an interview with the Herald, Mr Unsworth qualified his support for Ms Bishop, stating it was "just a catchphrase" which was designed to highlight his opposition to Mr Falinski.